The previous Planning Commission meeting ended in a tied vote on the proposed Eastwyck Crossing Apartments located adjacent to Indian River Park at the south end of Miller Avenue. The site was approved for a condo development in 2008, but now the developer wants to build a 240 unit apartment complex. 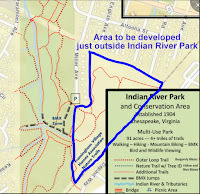 Concerns raised include the crowding of local schools (Indian River Middle School is over 120% of capacity), reduced proffer payments to the city (from $3811 per unit to $2000 per unit), negative impact to the city and school budget, the loss of the woodland at the site, and impact to the park. The proposal will have another public hearing at the next Planning Commission on Wednesday, December 9th, 7 pm at City Hall; those wishing to speak must register before 7 pm. Thereafter the proposal goes to the City Council in January for a final vote. For more discussion, see this post on Facebook. 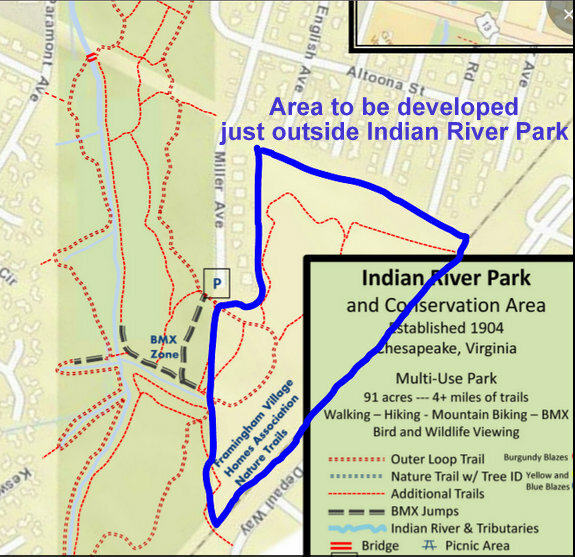 On Saturday, December 12th, we need volunteers to help remove Invasive Ivy at Indian River Park from 9:30 AM to Noon. We'll mainly be cutting English Ivy that has grown up trees. This will prevent the ivy from creating fruit and creating new outbreaks in the park. Please wear closed-toe shoes, a hat and bring work gloves; we recommend long pants and long sleeved shirts. Bring pruning clippers, loppers, screwdrivers (which are amazingly useful in prying ivy off tree trunks) and/or pruning saws if you have them. We'll have water and snacks available. Participants under 18 years of age must have adult supervision. Meet at the park entrance at Rokeby Ave. and Main St. (2001 Rokeby Ave.) which is located just south of Military Highway, i.e. across Military Highway from the Fire Station. On Thursday, December 17th, at 7 pm at Oaklette United Methodist Church, we will hold our end of year celebration to recognize our many accomplishments, recognize our volunteers, and socialize. Bring a desert to share and join the festivities. We'll have a silent auction, so you can finish some Christmas shopping too. If you have some items to donate for the silent auction, those are welcome; just bring them in and we'll add them to the auction table. Please also consider bringing a donation of non-perishable food items for the Oaklette United Methodist Church food pantry to the meeting this evening. Even if you have not been to a meeting in a while or if this would be your very first meeting, we encourage you to come out and partake in the merriment!